Jeera Biscuits (Cumin Cookies) – With a flavor of freshly roasted jeera (cumin), these cookies are delicious and very easy to make. Accompany these jeera biscuits with a cup of tea and have a perfect tea time! Jeera Biscuits (Cumin Cookies) are one of the easiest and tastiest biscuits one can munch along with a nice cup of tea. They are super easy to make. They are a bit different from the usual biscuits we have. This is because these jeera biscuits (cumin cookies) are salty and not sweet. We will add some amount of sugar in these biscuits but the overall taste they have is salty. * You can roast them in oven. Just spread the required amount of jeera (cumin seeds) on a baking tray and bake them at 170 degree centigrade for 8-10 minutes. * You can also roast the jeera on your gas stove. Take a pan or a tawa. On a medium flame, roast the jeera (cumin seeds) for 1-2 minutes. After this, we will cream butter and sugar together. Remember that the butter should be at the room temperature. Powder the sugar in a blender jar. Powdered sugar will melt or mix in butter easily. Now, we will add flour, salt, jeera and will make a dough sort of mixture. We will then roll it. Using a cookie cutter or any small cup or a small bowl cut cookies from this dough. We will bake them at 180 C / 350 F for 10-15 minutes. These jeeera biscuits are perfect for the tea time. You can also gift a box of these jeera biscuits to your friends and family members. Do try this recipe and let me know your experience for making these. If you have any questions feel free to ask in comments below. 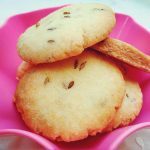 Jeera Biscuits (Cumin Cookies) - With a flavor of freshly roasted jeera (cumin), these cookies are delicious and very easy to make. Accompany these jeera biscuits with a cup of tea and have a perfect tea time! Roast jeera (cumin seeds). You can do this in two ways : You can roast them in oven. Just spread the required amount of jeera (cumin seeds) on a baking tray and bake them at 170 degree centigrade for 8-10 minutes. OR You can also roast the jeera on your gas stove. Take a pan or a tawa. On a medium flame, roast the jeera(cumin seeds) for 1-2 minutes. In a separate bowl, sieve flour. Add salt. Add roasted jeera (cumin seeds). Give this a little mix, so that jeera mixes in flour. Add the dry ingredients to the butter and sugar mixture. Add milk. Mix this nicely so that a dough is formed. Now, roll out this dough carefully. Cut jeera biscuits(cumin cookies) from this dough. Place these jeera biscuits on the baking tray. Bake at 170 degree centigrade for 20 minutes. Your jeera biscuits are ready!